Sitting out on a patio is one of the most relaxing experiences a homeowner can enjoy in their own yard. The relaxation ends, however, when uncovered patios get hit with rain, wind, and sun. Calling Alpha Natural Stones Plus for patio cover installation in Jacksonville, FL, lets you enjoy your patio even in the rain. Our more than 25 years of experience in the business makes us the perfect choice for dependability. We install traditional patios and pergolas, either of which goes a long way toward enhancing your exterior. We provide you with a free estimate so that you can get a good idea of cost before payment. As part of our building approach, we carefully evaluate our design plan with you to ensure you're getting what you want. The goal is to have to the final project match your vision and live up to your quality expectations. We’re proud to serve the local area, and it shows in everything we do. Our reputation is built on our customers' evaluation of our work. That's why we emphasize honesty and attention to detail. We never sacrifice quality for speed. With us, your cover is installed the first time correctly, so you don't have to worry about it leaking or falling apart on you right after you've paid for installation. Patio covers keep patios dry, allowing owners to enjoy them in all kinds of weather and every season. From the scorching days of summer to rainy days, your cover protects you and your property from all of it. You didn’t invest in a patio so you could only enjoy it some of the time; why not have something in place to ensure you can be out there whenever you want? Covers also protect any outdoor furniture from water and sun damage, so you won't have to worry about cleaning it as often. If all of this sounds good to you, get in touch with our professionals right away. We look forward to meeting your needs. Why Choose Our Patio Cover Contractors? 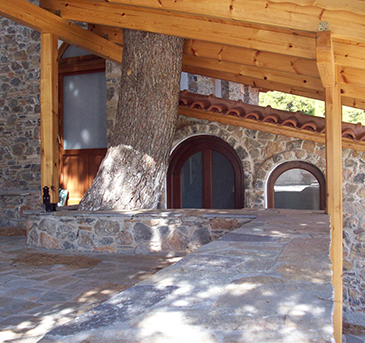 Knowledge and skills are paramount for any home addition, and Alpha Natural Stones Plus has that in spades. Our family-owned business has been at this for more than 30 years, working six days a week from morning until evening. With us, each client receives free estimates on stone and brick patios and covers, with each material bringing benefits. We’re happy to help you decide which is best for your hardscape installation project. The quality service doesn’t end once your patio is installed. Alpha Natural is also your local source for repairs whenever you need them. We apply the same high standards to concrete patio repair that we do to our installation work. There’s no one better suited to repair your patio than the company that installed it, and repair is the surest way to keep it lasting long and worth your money. Contact us to discuss your patio’s potential. We perform hardscaping projects in home and yardsin homes and yards all over Jacksonville, Ponte Vedra Beach, Jacksonville Beach, Atlantic Beach, and Neptune Beach, Florida, and the nearby areas.